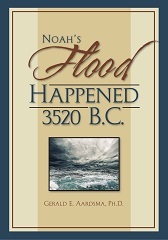 Resources: Books: Noah's Flood Happened 3520 B.C. Title: Noah's Flood Happened 3520 B.C. Subject Area: Biblical history; Noah's flood; Geophysics. Description: Noah's Flood Happened 3520 B.C. shows that the Flood is a real historical event which happened 3520 B.C. It shows that the Genesis narrative of the Flood is an accurate, eyewitness account of the phenomenon it describes. And it shows that the Flood was a catastrophe of global proportions with potentially serious implications for modern civilization. From the Back Cover: Is the Genesis account of the Flood a myth, or is it reliable history? In this ground-breaking book, the culmination of decades of research, Dr. Aardsma presents the truth about the Flood. You will discover solid answers to questions such as: What was the Flood really like? Was the Flood global in extent? Where did all the water come from? And where did all the water go when the Flood was over? Is there any scientific evidence for the Flood today? What physical mechanism lay behind the Flood? You will discover that the Flood did happen, just as the Bible says. The evidence is truly overwhelming.